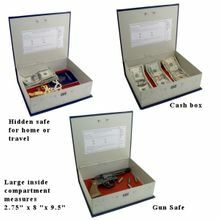 Larger than average metal book safe with combination lock will keep more of your goods, even handguns or pistols, locked away from prying eyes. Looks like an average dictionary on your bookshelf. Inside you can stash all kinds of valuables in its 8 inch by 9.5 inch by 2.75 inch space. The safe is metal surrounded by the leather-like book cover. You can set your own combination for the lock. Can bused as a locking cash box. Great place to hide your stash. Most thieves do not want to spend much time in the place and just want to grab whatever cash or valuables that are lying around. Using this lockable book safe, you can hide those valuables and not expose them to thievery. Good for keeping things away from young ones, too. We also have book safes with a key lock below.